Cats may not be the biggest fans of donning silly costumes for the holidays, but here’s the thing: They look ridiculously cute when they do. That’s why many feline lovers opt to dress up their kitties in cat Halloween costumes, despite the eye rolls or hisses their cat might give them. Whether you want to DIY a costume or buy one that’s ready to wear, here are some costume ideas that will look absolutely purr-fect on your cat this Halloween. Why dress your cat up as a basic pumpkin or witch, when you can pay homage to one of the greatest TV shows in recent years with a miniature Breaking Bad-inspired costume? Bonus point for getting Bryan Cranston’s goatee just right. Typically when restaurants give us a wimpy little taco, we are annoyed! (We like ours to be bursting at the seams with rice and guac.) But in this case, a tiny taco is the perfect size costume for this little kitty. Twinsies alert! If your cat doesn’t care about Halloween candy but loooves stealing your french fries, then this costume will show off his allegiance to his favorite fast food chain. 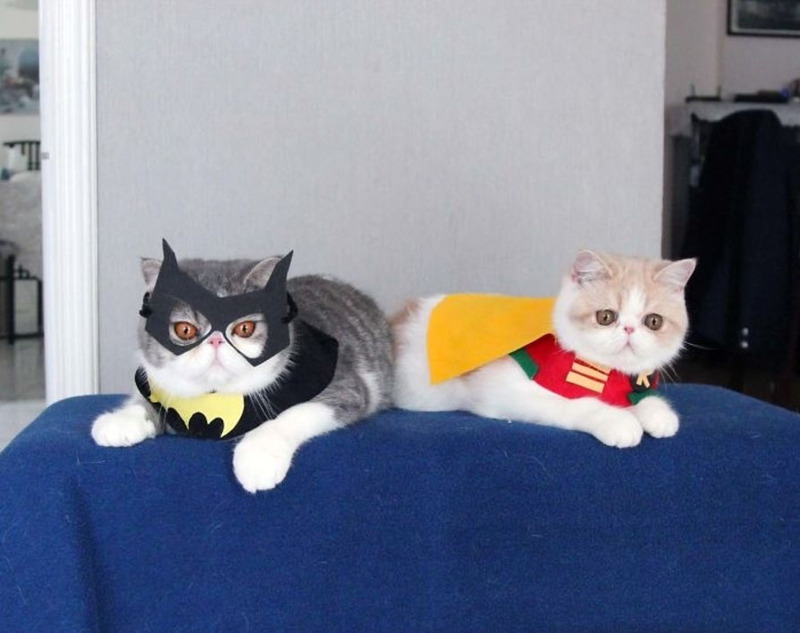 Although they’re less likely to hunt down villains and more likely to purr and paw at them, nothing is more cuddly than BatCat and Robin! We’re guessing from the look of terror on this cat’s face that she has seen the scene from Annie Hall where Woody Allen and Diane Keaton boil the lobsters for dinner. We’re not sure what exactly this cat is dressed up as, but we’re getting some Diana Ross vibes. Regardless, this photo is a good reminder if you don’t have time to put together a full cat Halloween costume this year, you can always stick a little wig on your wee one, and the results will still be adorable. A minion’s work is never done! Perhaps that’s why this kitty is so tired. He’ll get back to serving his despicable master and helping set up for the Halloween party, as soon as he’s finished with his nap. Who’s got five eyes but can only keep three of them open? This purple monster Halloween cat hybrid, that’s who! Forget Henry Cavill and Gal Gadot! These two cats are ready to start filming next year’s summer action movie. And with their furry good looks and ability to scale walls, The Adventures of Super Cat and Wonder Kitty is sure to be blockbuster gold. Although your cat is merely the king of your apartment and not a whole jungle, you can still give your pint-sized sweetie a confidence boost with this lion mane that will make him feel extra ferocious as he stares out from the living room window and flicks his tail at the birds. “This Halloween costume is silly, it is. Use the force to remove it, I will.” – Yoda Cat. For the cat who loves Nobu more than Fancy Feast, this sushi cat Halloween costume is just paw-some. A cat who is lord of the Roomba and master of the automatic cat door will appreciate this Halloween costume. It’s also the perfect DIY way to use up all of those leftover Amazon boxes that are laying around. Just add some tinfoil, and voilà!